The words ‘Moscow, Moscow, Moscow,’ are delivered in an enthusiastic tone to audiences on Kingsway this week. 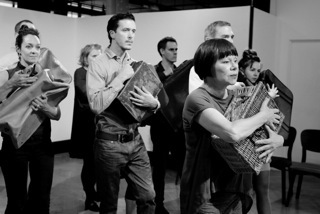 Internationally formed, London based theatre company, [Foreign Affairs], present their tenth production; the first since their Scandinavian series (2012 – 2013). To Moscow With Love extricates passages from Anton Chekhov’s famous late Nineteenth and early Twentieth Century plays, cross-examining themes of love and longing on Russian terrain. Perpetuating aims of working in new and unusual ways, Trine Garrett (FA’s co-founder) bravely conceptualises Chekhov’s short stories in a mish-mash of farciful and melancholic scenes, tackling plights of the human condition in original pop-up theatre style. On the most part it works rather wonderfully; appealing in its originality and warming in its embrace of Chekhov’s questioning concerns for beauty, love and unhappiness. Maintaining London’s multiculturalism as a primary showcase platform, and taking inspiration from international societal diversity, Garrett has adapted a simple, relinquished space to bring Chekhov’s seemingly biographical scripts to life. In communal curiosity the audience are taken on a journey, through double doors, into a world of Chekhovian lives of the past that confront timeless human problems. Unifying extracts from ‘The Seagull’, Chekhov’s first major play, ‘Uncle Vanya’, ‘The Three Sisters’, ‘The Cherry Orchard’ and ‘Ivanov’, the nine-piece cast present a sliding shelf of characters, incorporating stereotypical traits of Russian customs along the way. Moscow is the connecting symbolic component of the intertwining tales, coveted by each character as if it were a desired person itself, though it never materialises. The actors connect tremendously well with one another, and do well in generating a casual intimacy among the audience. At times a slightly forced approach ensues, though it reflects the intensity of the play; the ensemble are highly engaging. Collectively, the performance is innovative and natural; the direction refined, if at times derailing. The stories tend to blend together towards the end, spiralling rather morbidly into the serious tones associated with Chekhov’s representations of unrequited love and wasted lives. The production nonetheless succeeds in staging an interesting look at how love is effected by social change and inherent gender attributes, making for an enjoyable and somewhat philosophical experience. To Moscow With Love is showing until Saturday and tickets can be bought here. For more details visit [Foreign Affairs].